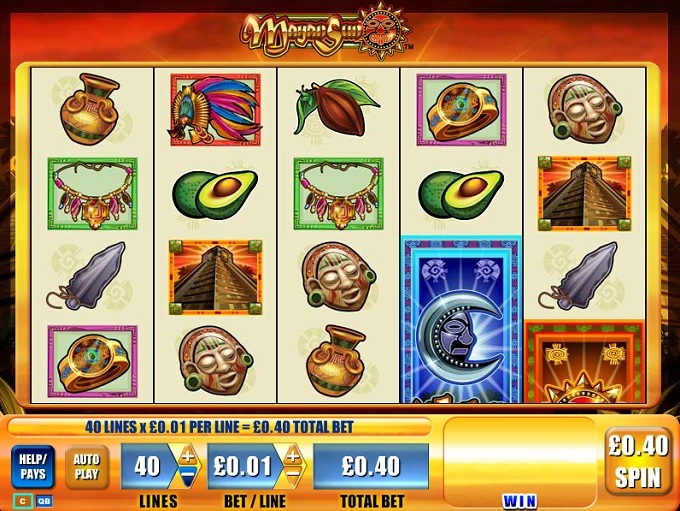 Mayan Sun is a game which comes from WMS and just like the title suggests it is themed around the Mayan culture. The Sun was a big part of their religion, so naturally it is one of the main symbols as well, along with the Moon, which is just as important in the game. The Mayan theme is often used in games from all developers, which seem to enjoy putting out titles inspired by long lost South American civilizations. Mayan Sun has 5 reels and on them you can have as many as 40 active win lines. You also get a chance at landing stacked wilds and have them trigger free spins with multipliers for you. The biggest reward you can expect is at $2,500. 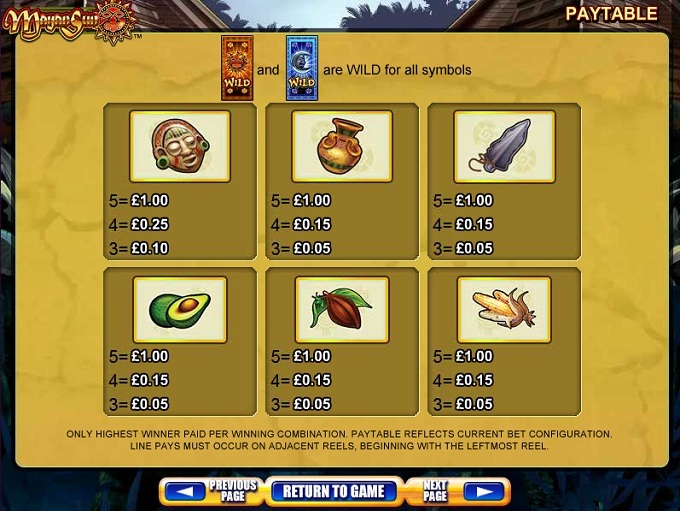 Load up Mayan Sun, and as you play the game you will find that you get stacked wild symbols which can also act as scatters, and that you can receive from them free spins and x2 multipliers to double the wins. The slot’s two main symbols, the Sun and the Moon, are shown each in their own icons. These are stacked symbols, which occupy four positions on a reel if they’re fully visible. One is orange and has the Sun, the other is blue and has the Moon. They’re both highly decorated, the way the Mayans would’ve drawn them. Having wilds on all the reels can bring you combinations which pay 500 coins, but prizes are only offered for all five icons. 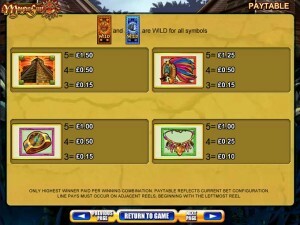 If the wilds are mixed in the combo of five icons, the payout is 250 coins. The stacked wilds will act as scatter symbols as well, since there are no other icons with this role. 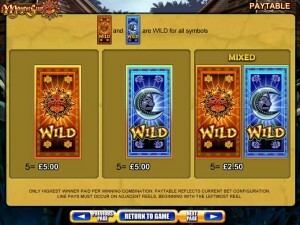 Have two or more wilds arranged from the left to the right, and you will get free spins. 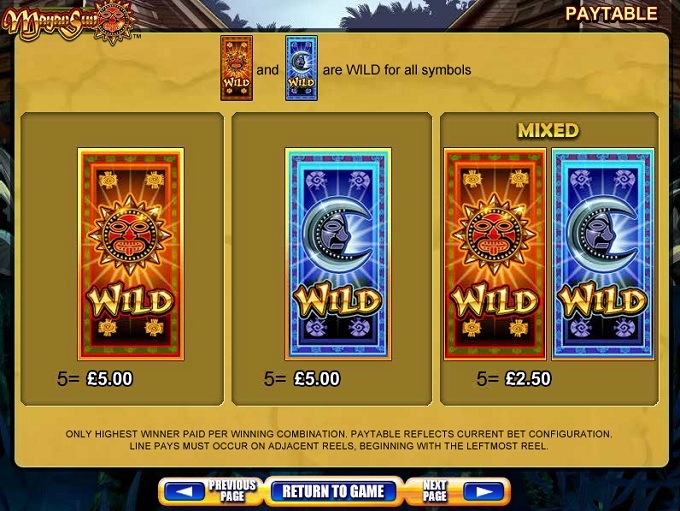 5, 10, 20 or 50 free spins are given to players that have 2, 3, 4 or 5 stacked wilds present. The wins obtained in these free spins are doubled in value. The betting options are at the bottom of the screen. You have the Lines first, which go up to 40, and then there is the Bet/Line option, which starts at $0.01 and can be taken up to $5. If you max out both of them, the wager is at $200. Get a combo where five matching wilds contribute, and the reward will be 500 coins ($2,500). 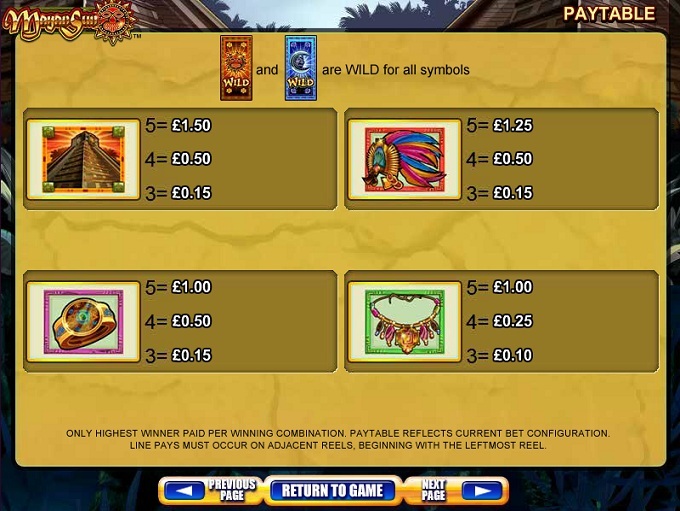 If there are both types of wilds in the combo, it’s at 250 coins. One thing you will enjoy is the theme and the way the design follows it. The background image shows you a picture with a dark orange sky, the Sun being the one responsible for that part apparently. The reels are filled with images of objects of Mayan origin, buildings that they created, the Sun and Moon that they worshipped and even some fruits which the jungle around them provided. Symbols: Sun (wild, 500 coins), Moon (wild, 500 coins), Mayan Pyramid (150 coins), Headband (125 coins), Sundial Watch (100 coins), Necklace (100 coins), Mask (100 coins), Ceramic Pottery (100 coins), Stone Blade (100 coins), Avocado (100 coins), Coffee Bean (100 coins) and Corn (100 coins). The Mayan theme has been done a bit too much, but that doesn’t cancel the quality of the features or the pleasant design style. If you’re not too tired of Mayan slots yet, this title might be worth pursuing. 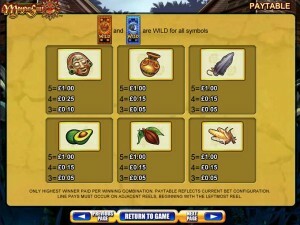 Mayan Sun can be found at any WMS casino, where you get a chance to play it for real money or in free mode.